The garrison at Fort Adanto had become accustomed to regular attacks, violent storms, and all manner of unpleasantries from the wild country around them, but they could never have known who would stumble into their lofty barricade from the coast. Guards and priests alike peered over the Fort's tall, thick walls at the shrunken, crazed-looking figure below. It was a hierophant, a vampiric man of the cloth, covered in sand and cheeks sunken with hunger. His eyes were wild and his beard was coarse with a madman's ambivalence. He bellowed upward at the faces peering down, "I have conquered the waves and death itself, praise Saint Elenda!" The guards looked to one other uncertainly. The man below had ripped off his tunic and fallen to his knees, his long-nailed hands clasped in benediction. His prayers were loud, absent of any self-awareness. The mortal guards recoiled in discomfort—whoever this was had been lost to the Blood Fast. "Wondrous miracles! Empty arteries and lapping tongues, she gave us life! Rejoice, you tepid fools!" The human guards dared not open the door. A vampire in the midst of the Blood Fast was tremendously dangerous. One lost to themselves would not be able to discern between the blood of the faithful and the blood of a sinner. Instead, one of the guards fetched a priest for help. The starving vampire outside the fort grew more fervent in his prayer. "I forsook sustenance to bring myself closer to blessed Saint Elenda, and here I stand!" He reached into a moldy bag hanging from his side and threw a jumbled mess of metal onto the ground. The guards could make out a crushed sextant, a broken compass, and a menagerie of other ruined navigational tools. "I KNEW WE DID NOT NEED THESE TOOLS OF DECEPTION!" the vampire screamed. "My faith in Elenda drew us here!" The priest of Fort Adanto had made her way to the door. She called through the thick wood to the vampire on the other side. "No ships have arrived today. What vessel brought you here?" "The sacrosanct buoyancy of inviolable faith!" howled the vampire. "The finest ship in the Legion of Dusk! I arrived on Her Majesty's Courage!" The vampiric priest rolled up her sleeves and nodded at the guards to open the gate. The guards lifted the locks and pulled at the door's massive chains, and the starving vampire stumbled inside. The priest gasped. "Hierophant Mavren Fein?" "Saint Elenda was the first!" Mavren Fein raved. "Her sacrifice is our survival, her selflessness the model of our success! I took the rite two hundred years ago, and under the guidance of Saint Elenda the First, we will find the way to immortality without the need for blood!" The priest was kneeling now, picking up the broken pieces of Fein's equipment. She looked up at Mavren Fein with shock. "Were these the navigational tools of your ship?" "I knew we did not need them!" Mavren Fein spat in response. He stilled, suddenly sniffing the air, and looked up at the guards on the top of the Fort's walls. The guards backed away from the ledge, but not nearly fast enough. Mavren Fein hissed, and ran at the wall with his eyes locked on the humans above. He began to claw his way up the sides of Fort Adanto, chunks of wood flying in jagged splinters as he climbed ferociously. His face was a terrible mask, teeth bared and eyes wide. He snarled and scrambled upward, snatching the nearest human guard with nails as sharp as knives. The man yelled in surprise, and Mavren Fein bit madly at the metal covering between the guard's jaw and collarbone. Though none could react in time to stop the blood-crazed vampire, the attack was in vain—his teeth could not pierce the armor before the other guards ran forward, kicking him off the ledge. He hit the ground with a thump, and in a moment the priest of Fort Adanto was on top of him, pinning him to the ground to prevent another outburst. "Your piety is apparent, Mavren Fein," the priest grunted with effort, "but your Blood Fast must end if you wish to remain at Fort Adanto. Break your Blood Fast, Hierophant. Your reverence is manifest, but your mission will require your full awareness." The priest wrestled Mavren Fein to his feet and began to walk him toward the prison cells. The Legion of Dusk had little use for long-term prisons, but temporary holding cells were necessary for getting prisoners to their full health before sentencing. Mavren Fein was led down into the cellars below the church in the center of the Fort. The walls were wood-lined earth, and lit with delicate oil lamps. The priest opened an iron door at the end and guided Mavren inside. The noises of a single whimpering man leaked under the gap between the walls. "Manuel killed a compatriot in a fight over a game of cards," the priest said to Mavren Fein, motioning to the cell next door. "He will be the one to break your fast at dusk tonight. I'll prepare the necessaries for the ceremony." The priest shut and locked the door, and departed upstairs. Mavren wandered the perimeter of his cell, stomach growling and teeth chattering with excitement. "Do you know of Saint Elenda, criminal?" he asked through the wall. A whimper let through the other side. Mavren Fein closed his eyes and raised his hands. "Saint Elenda, the most devoted of the devoted, the First and the Faithful. She was born mortal, a warrior nun charged with her brothers and sisters of faith to guard the Immortal Sun in the mountains of Torrezon. Listen!" The whimper turned to a yelp. "Pedron the Wicked killed them all. Guilty, greedy, foul betrayer of his own!" Mavren spat. "But she, she survived; she was nine feet tall! Hair like a raven's wings and nails like lightning's edge! She ran outside to fight Pedron, but the Immortal Sun had been stolen from the fiend by a winged beast in the sky!" The whimpering next door had stopped. Manuel was apparently listening. "The beast took the Immortal Sun to the west, and Saint Elenda followed it! Staunch piety! Blessed Saint Elenda!" ". . . How did she become the first vampire?" Manuel mumbled from the adjacent cell. He yelped as Mavren Fein slammed his body up against the connecting wall. "She was a genius! She was a visionary! She turned to dark magic and took on the burden of immortality until the Immortal Sun could be retrieved once again! Blessed wonderful brilliant Saint Elenda, the First and the Faithful. She searched for centuries and returned, yes, she returned to Torrezon, and taught her Rite to the nobles so that we may take up the sacrifice and join her in her search. Genius! Visionary! Blessed by the Night itself!" Mavren Fein scraped his nails along the wooden wall. "I was one of the early ones. I watched as she sailed back into the west and have waited for my day to follow her. Patient patient patient. I'm very good at waiting." Mavren Fein went quiet. The only noise was of Manuel's heavy breathing from the adjacent cell. The vampire knelt, hands shaking with the mania of the Blood Fast. He snuck his fingers under the gap of the walls separating him from the human. In one motion, Mavren Fein pulled back, and snapped the wall from its sides. He tore through the planks of wood, diving through the broken boards and onto his prey. A breath later, his teeth were at the neck of the criminal, and the coppery scent of blood filled the air. Mavren Fein consumed with abandon. Alarmed by the sudden noise, the priest and guards ran down to the cells, and stopped at the sight in front of them. They looked on reverently as Mavren Fein feasted. Vampirism was a curse, a burden placed upon oneself for the greater good. This vampire's condition was self-imposed, sad, but necessary. What was theirs would not be returned without sacrifices like his. Mavren Fein gasped and wiped his mouth with the length of his sleeve. Self-awareness had returned to his face, and his body grew still. "Priest, tell me your name." His voice was calm and measured. A complete opposite of the vampire who had raved and ranted before. "Mardia," said the Priest. She bowed her head. "I'm sorry I was not able to perform the full ceremony for the breaking of the Blood Fast—"
"It's quite all right, pious Mardia," said Mavren Fein. He finished cleaning himself up and stood with hands clasped in front of him. "My apologies for the mess I've made." "The rest of your crew is dead, then?" Mardia asked. Her hands quickly motioned a blessing. Mavren sighed and nodded. "Yes. We ran ashore when the navigational instruments were destroyed. A pity. But I intend to continue our mission all the same." "What resources can we provide you, Hierophant?" Mavren Fein smiled gently. "A change of clothes. A staff. I have no need for a compass." Vona of Iedo, Culler of Sinners, Butcher of Magan, had earned her reputation through centuries of warfare. The Apostasine Wars had provided enough entertainment to ensure that her sword was always wet—and her thirst always quenched. Kingdom after kingdom on the continent of Torrezon fell to the unified Church and Crown, and Vona relished every conquest. And now, on the deck of her ship, she eagerly approached the Brazen Coalition ship on the horizon. The greatest day of Vona's life was, naturally, the day of her second birth, spent kneeling in a church, working the spell that would bind her life to serve the crown and church in perpetuity. She thought often of that first taste of a heretic's blood and the vow she made as she cast the spell: "Our thirst shall be our penance. Our service shall be our lives. Now and forevermore, the blood of the guilty shall sustain us until we discover true immortality." Vona remembered the rush of new life, the pang of hunger in her gut. Her gifts were incredible; she could walk with the silence of a predator and kill with the same skill. She was never afraid to walk alone at night for the soul of night beat in her heart, coursed through her blood. Why on earth would the church ever want to stop thirsting for blood? She kept that opinion to herself over the centuries, of course. When Torrezon was finally under the control of the Legion of Dusk, Vona had a difficult time transitioning into a peaceful lifestyle. She had become a noble with her own lands, but the territory was poor and rocky, and it became quickly apparent she was not an able administrator. Her ennui lasted a decade. One night, in a fit of boredom, she decided to break the monotony. It was fun, mundane as a child's game, a quick way to pass the time. She stalked each of her human serfs in their beds and in their fields, and over the course of one happy week killed each of them as part of a pleasant game. Vona rejoiced in the sport of it, and abandoned her humble estate. As soon as Queen Miralda had announced she was assembling a fleet to voyage in search of Saint Elenda—THE Saint Elenda!—Vona had volunteered to lead the first ship that left port. She was thirsty. Ever so thirsty. Whether her prey were guilty or not, she would have her fill along the way. It only worked if she told no one else how little she cared for the rules that bound her. The secret kept it exciting. And now, a Brazen Coalition ship was in Vona's sights. Vona stood at the bow of her ship, looking out over the sea with sharp, inhuman eyes. Her mission now maintained that same excitement, kept the ennui at bay. The Belligerent was scrawled on its side, and that ship's crew was distracted by the shore up ahead. A siren flying high above the mast had spotted Vona's ship by now, but they were a small speck against a rapidly-darkening sky. Vona was hungry, and by nature of their allegiances, The Belligerent was full of guilty traitors ripe for consumption. Boarding the pirate ship was ironic, but necessary to keep her sated. A sudden wave tilted the ship violently forward, and Vona grabbed the rail to regain her balance. "Where did this storm come from?!" she yelled to her navigator. The human jabbed his sextant toward the shore. "It must have been summoned! The River Heralds of Ixalan are famous for their elemental—"
"I don't care what they are famous for! Focus on the Brazen Coalition ship—we're nearly close enough to board them!" Vona watched as her priest lifted his staff into the air, conjuring a churning, black smoke that engulfed their ship. The Belligerent was tantalizingly close (and, heaven above, Vona was starving). But the sky had turned from drizzly gray to an angry black, and the sea lifted Vona's ship high up to meet the crest of its waves before tumbling back down. Crewmen worked to raise the sails and turn the ship into the wind, but the incessant waves threatened to overturn them all. Vona saw the white line where the beach met an outcropping of rocks. Her eyes went wide, and she shut them tight just as her ship rammed into the side of the sea stack. She fell overboard and tumbled through the waves, body loose as a rag doll in the violent push and pull of the sea, and eventually she pulled herself to the surface. Behind her was the wreck of her ship, around her were the bodies of her crew dotting the harsh white of pristine sand, and before her was a wall of dense, dark jungle. Vona stumbled forward through the waist-deep shallows and felt her foot slip on the rocks below before finding its grip. She walked onto the beach and tripped over chunks of broken wood tangled among beached kelp. Splashing behind her signaled that she was not the only survivor, and sure enough, a few ragged members of her crew were gasping and wading beside her. They mattered in the sense that strangers in a market mattered—they were alive and had their focuses and their purposes and their tasks, but their function was peripheral to hers. Vona's crew was a means to an end. They had reached the shores of Ixalan and had thus achieved their end. But hers? Her purpose was one touched by divinity and delivered by the queen herself. An ancient feeling stirred in her heart. Vona of Iedo, Butcher of Magan, now stood closer to Saint Elenda than she had ever been in her life. A barbarian's smile spread over the planes of her face. At last. She half-walked, half-swam her way out of the shallows. A few of her crew were calling for help or pathetically slapping the waves, but Vona ignored them. She and her crew had been pursuing the Brazen Coalition vessel for days. Vona had instructed her navigator to prepare to board in order to feed the vampires in preparation for the land expedition ahead. Her kin would need their strength, after all. Now, as Vona looked to the pirate ship that lay beached beside her own, she understood that this was serendipity. Vona was elated. If the rumors are true, then the stranger who bears the compass is her captain. The vampire paused and weighed her options. She could either wait for the leader to emerge . . . or she could ambush the captain in the thick of the jungle. Vona's grin returned. It had been far too long since her last hunt. A few pirates tumbled ashore behind her. Vona sniffed the air. A man, ragged with trauma, sat cradling a freshly broken arm in the sand. His clothing bore the typical rags of a Brazen Coalition pauper, and his face was lined like rumpled linen. He locked eyes with Vona and fell back onto the sand, pushing himself farther and farther away with tired legs. "Please, no! I'm not a criminal!" Vona strode forward and looked down her nose at the pirate. "Do you recognize the sovereignty of Queen Miralda?" The vampire sneered. "Then you should know what her majesty thinks of liars. I find you guilty of deceit, and a criminal in the eyes of the Church." A blur of noise and sand punctuated her decree, and Vona efficiently silenced the scream that emerged from the pirate's throat. She drank greedily, and felt the sinner's blood fill her with righteous purpose. Distantly, she knew she was making a mess, but that did not bother her. The sea would wash away her untidiness. The vampire gasped with sated satisfaction and picked up a sword that had washed onto the beach beside her. Vona marched toward the thick wall of green. She wasn't the patient type. She knew her crew would follow suit when they could keep up. Besides, she did not need them for the task ahead. She was the Butcher of Magan, and the Immortal Sun was hers for the taking. Jace was thankful he somehow remembered how to swim. In the chaos of the storm, he had leapt overboard alongside Vraska. Jace grabbed a floating piece of wood to conserve energy and began kicking himself to shore. He sighed in relief through a mouthful of brine when he spotted Vraska surfacing. She swam over to him with firm, confident strokes, and the two began making their way to shore. "Someone started that storm," Jace noted, spitting out saltwater. 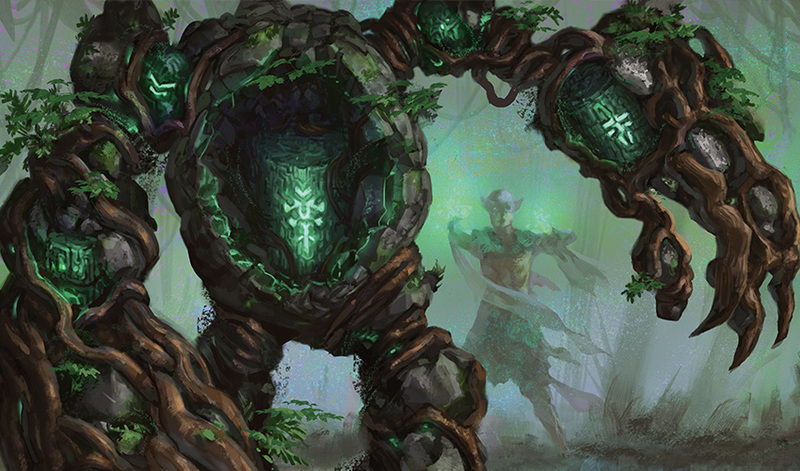 "There was an elementalist on shore, up on that rock over there," Vraska said. "Can't see them anymore." Jace looked to the nearby outcropping. To his left was the Legion of Dusk ship that had been in pursuit. It was dashed across the rocks, but one of its smaller vessels had survived. The smaller ship was floating at a cockeyed angle in the shallows near a broad delta. "See that dinghy? We can sail that upriver to the interior of the continent," Vraska said. "I'm going back for the crew. Don't die." Jace nodded reluctantly and made his way onto the beach. Having just survived a nautical disaster, he had no intention of dying now. The beach here was rougher than Useless Island had been. It was peppered with wayward rocks and deposited kelp, and the outgoing tide made everything stink of the sea. The air was charged with the weight of the conjured storm, and the breeze it carried was heavy with humidity. The effect was discomforting. It was time to leave before things inevitably got bloody. He felt like he was at the starting gate for a race, as if some door would swing open and a rabbit would be let loose for him to chase. He began to make his way toward the beached dinghy. Now that he was out of the water, he could see the tremendous damage the storm had done. The Belligerent was smashed into the side of the Legion of Dusk ship. Bits of each ship stuck out of the other, and their wooden masses tangled up in each other. Jace could make out bodies in the water, but dared not look closely enough to discern which were his friends and which were his enemies. His heart caught in his chest. Malcolm. Breeches. Gavven. Amelia. These were the only people he could remember ever knowing. Jace heard a mumbling phrase grow louder in his mind. It sounded hungry, furious, like some kind of an animal. He looked to his right and saw a vampire in shining armor running full-speed toward him through the sand. Panic jolted through Jace's mind, but as instinct overtook him, his perception slowed almost to a standstill. The vampire's mind appeared to him, coiled glass and wisps of fragile energy. Jace reached out and, sensing the immensity of his own power, made a significant effort to allow only a minute pinprick of it to reach his target. He charged that small expression of power with one simple command: sleep. Time resumed. Jace gasped. The vampire in front of him stumbled in the sand and collapsed to the ground, snoring. Jace froze in his tracks and looked down in pleasant surprise at the vampire at his feet. Vraska was running toward him. CLOSE YOUR EYES—she mentally yelled loud enough for him to hear. Jace screwed his eyes shut and heard something fwump in the sand behind him. He looked back and down. A petrified vampire lay at his feet. The thing looked as if it had fallen out of a museum. The vampire was frozen mid-run, his clothing solidified in impossible-to-carve thinness, his detail captured down to the pores of his face. Had Jace known otherwise, he would have thought this to be a statue carved by a master's hand. It was almost beautiful. Vraska came to a stop in front of him. "We lost Edgar," she said tightly, turning back toward the ship. Jace followed, leaving both the sleeping vampire and its stone crewmate behind. The surviving crew of The Belligerent was shaking off the crash and bracing for a fight. Several vampires were swimming ashore with ease despite the obvious weight of their armor. Their gifts were good for more than just feasting, it seemed. 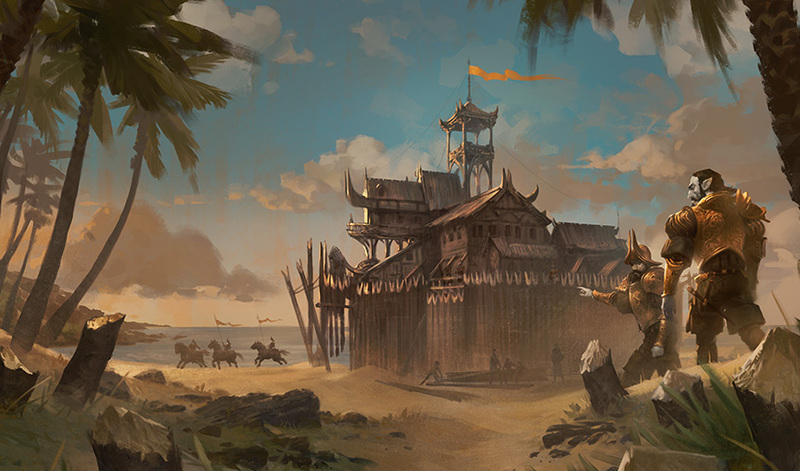 Breeches easily ran across the sand toward Vraska, his tail streaming behind him as he ran. "We fight, you go!" he yelled. Vraska knelt to his level. "We go as a crew," she said tersely. Breeches shook his head. "We fight Dusk, you find Sun! Meet up later!" "How will you find us?" Vraska asked. Breeches pointed at Jace. "Follow fancy illusion!" Vraska nodded. "Jace will make something tall when we get off that boat upriver. Have Malcolm check high up every hour to look for us." Vraska said, nodding resolutely at Breeches. The goblin nodded and shambled back to the survivors on two legs, waving two little knives in each of his hands like a murderous rag doll. "Breeches!" Vraska called one last time. The goblin turned around, and the rest of the crew behind him listened attentively to their captain. "We're not here to stay. Leave the locals alone," said the gorgon, "but kill every vampire you find." The goblin grinned, and the crew of The Belligerent drew their weapons and charged the remaining vampires. Jace shivered despite the summer heat. He was glad he was on the pirate's side. "Beleren! With me!" she called before racing off toward the small ship in the river. 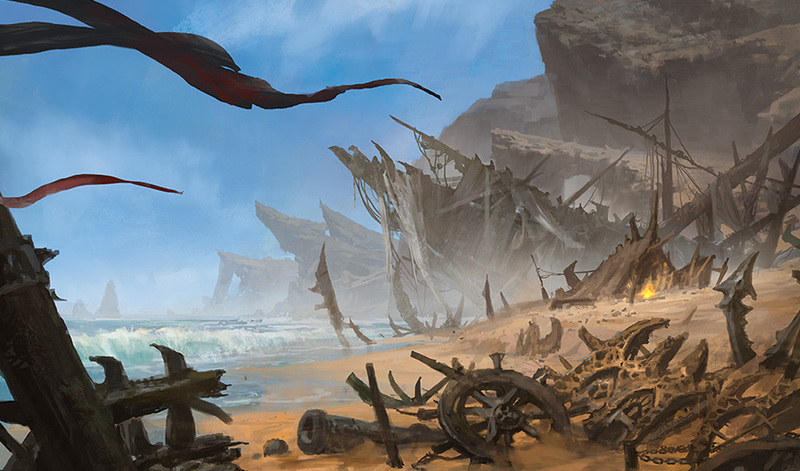 Jace and Vraska ran with heavy steps through the sand of the beach toward the small ship near the river delta. The ground beneath them gradually went from a smooth, wet surface to lumpy dry sand that kicked up into their shoes as they ran. They passed the body of a pirate crewmen soaked in his own blood, and Vraska swore. Bloody tracks led away from the body into the thick of the jungle. Vraska looked back to Jace as they ran. "Jace, you need to camouflage us." He shut his eyes and dutifully willed a veil of invisibility over himself and Vraska. He hid their movements as they ran over the beach and cast an illusion to disguise their footprints. Vraska splashed through the shallow water of the estuary and climbed into the boat. Jace hoisted himself up and tried to catch his breath. 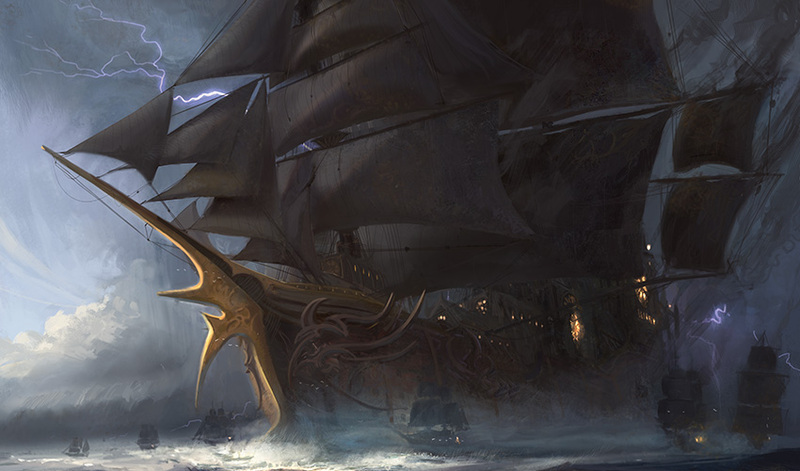 Safe under the veil of Jace's illusion, Vraska busied herself with setting the sails. The boat was small, likely intended for fishing and scouting voyages. Its dark sails fluttered, and a sudden inland breeze pushed them upriver into the jungle. "May as well use the wind while we can. We have a lot of rowing ahead," Vraska remarked. They watched as the impending battle on the beach began, but as they passed into a maze of trees, they lost sight of The Belligerent for good. The noise of the fight and the pull of the waves were replaced by the chirping of insects and the calls of small flying reptiles above. 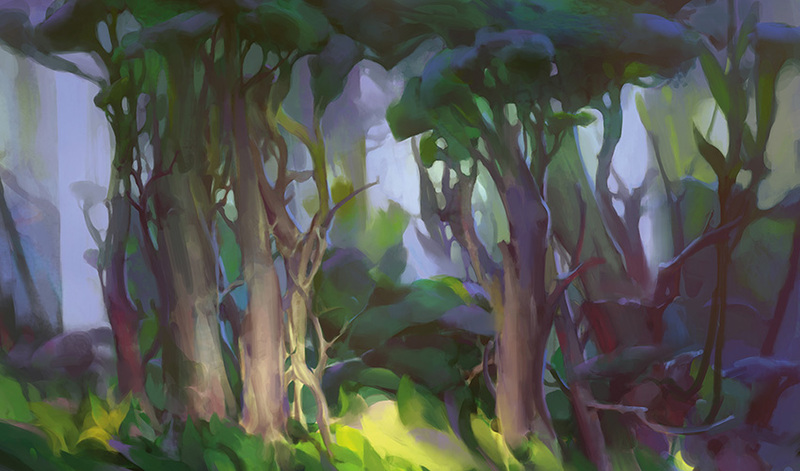 The jungle here was different than that of Useless Island, and Jace marveled at the size of trees. On his island, they were stunted by spatial restriction, but here the trees spread wide and tall. He felt shrunken, a miniature version of himself tossed into a massive garden. Vraska was busying herself trying to capture the dwindling breeze in her sails. She gave up after a while, and pulled the oars out from under her seat. Her brow was furrowed in visible concern. "You're worried about the rest of our crew," Jace noted as he began to row. Vraska nodded. "Yes. But they can take care of themselves," she said. "I'm their captain, not their mother. They'll find us after they've eliminated the threat." The canopy began to close over them. Shadow and green surrounded their vessel, and the river started to narrow into a deep channel. Branches crisscrossed overhead, and the sun vanished entirely. The air was thick, clammy, and fragrant with the musk of damp earth. He glanced over the side of the boat. A school of fish was playfully swimming below. He could just make out their shapes in the cloudy water. Jace looked up, and Vraska was giving him an odd look with an intent he couldn't interpret through expression alone. She looked almost ill with hesitation. "Neither of us are from here," she blurted out. Jace blinked. "Well, obviously. 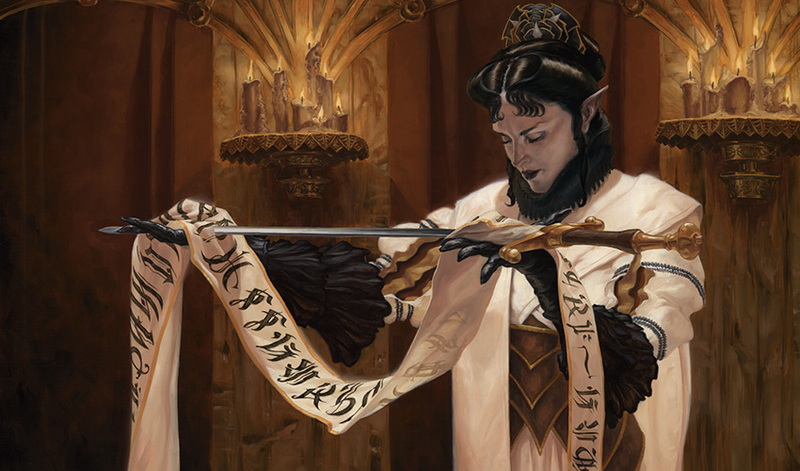 You said we were from Ravnica—"
She was grimacing, reluctant to talk but even more reluctant to keep it to herself. "Ravnica isn't on this plane." Jace's eyebrows lifted as far as they could. "This plane?" Vraska was visibly trying to find a way to put into words what she was trying to say. She stuffed away the compass Jace had given back to her, and talked with her hands. "You told me your body disappeared and reappeared when you first arrived, and there was a symbol that appeared above your head, right?" Vraska let out a breath and stilled herself. A strange shadow darkened their boat, and her body faded out of sight. Jace leapt to his feet so quickly he nearly fell off the boat into the current of the river. He heard a sudden thud and spun around—Vraska had reappeared on the other end of the boat—the same spot she had left had the boat not been travelling upstream—and the same triangle-circle symbol had appeared above her head. Jace's jaw was entirely slack. Vraska waved her hands in a little ta-da. "I'm one too. And usually, when we—" she motioned to them both, "—do that—" she motioned all around, "—we can travel to other planes of existence. We're Planeswalkers." This was entirely too much new information to take in at once. Jace began to ask the first of thirty questions that immediately sprang to mind. Vraska stopped him with an outstretched palm. "Wait till I'm finished! Now, whenever we try to planeswalk, something yanks us back, and we aren't allowed to leave. Right? I believe that Orazca doesn't just contain the Immortal Sun. It also contains the enchantment that keeps us here. I was told to perform a spell to contact another plane when we found the Immortal Sun, and after we do that I think we'll be able to leave." "A dragon taught me how to sail, Jace. Who knows what is possible anymore?" Jace was absurdly excited to put the pieces together. He locked eyes with Vraska and thought out loud with gusto. "We thought the compass was just pointing to the city, but it points to blooms of powerful magic." He nodded at Vraska's pocket. "Instead of magnetic north, it points to aetheric north, and it also points toward large outliers of similar kinds of magic. That's why it pointed to me when you found me, and that's why it's probably pointing to you now. I tried to tell you on the boat before we crashed." She pulled out the compass. It was pointing at her, but slowly shifting back as the mark above her head vanished. Jace nodded in self-confirmation, fiddling with a switch at the side so the second beam pointed toward what he knew now was aetheric north. He toggled it on and off, with the point toward Orazca remaining static. "We can use it to accurately map our route by calculating the angle between aetheric north and Orazca . . . or we can just follow the direction pointing to large expressions of magic like you've been doing. One is a bit less elegant, but it works." "That's . . . incredible," Vraska said, blinking at the thaumatic compass. She smiled, laughed. "The barrier must rely on the same magic we use to planeswalk! That's why the compass points there! You figured it out!" Jace disguised his bashful look with a well-coordinated shrug. Vraska continued, "I was so certain that the person who sent me here was going to end my life if I didn't find what the compass pointed to. But now we have a chance, thanks to you!" "We both have our talents," Jace replied with humility. Vraska grinned. "And yours are incredible!" She paused for a moment. Something in Vraska's face shifted. Softened. "Jace, I'm sorry I kept planeswalking from you. I didn't know if I could trust you when I found you. No more hiding things." The waves gently lapped at the side of the boat as she rowed. "I never got a chance to thank you for what you said that night when we were docked at High and Dry. No one has ever listened to my story like you did. Thank you." Jace smiled. "Your story is worth telling. Thank you for sharing it with me." The gentle smile she gave in return gave him pause. It was vulnerable and honest. Eyes locked with his. Everything about this jungle was bright and over-saturated. It all felt weighty with meaning. Jace had dozens of questions lined up, all of them severely different from one another in tone, a hodgepodge of inquiries both mundane and fantastical. Did she like books? What were the metaphysical properties of the space between planes of existence? How was planeswalking different from casting a normal spell? What was her favorite dessert? But something at the back of Jace's mind caught his attention. He surveyed the banks of the river. He sat silently for several seconds, stretching his power out to see if they were being followed. The invisibility cast over the boat was holding. The surrounding mile was largely empty, but there were some impressions on the outer rim. He concentrated as hard as he could to widen his range of perception. Vraska looked at him intently. "Do you sense anyone?" Jace nodded. "One human, one vampire, a merfolk . . . and a minotaur." Vraska's brow knotted in confusion. "A minotaur?" Thick mangroves gave way to plush sand, and Huatli felt her mount sink slightly with each step into the pristine beach below. She turned around and gave a brief hand motion to her second-in-command—this was the area in which the merfolk had last been spotted. This is where she would find her guide to lead her to the Golden City. Huatli's spirits rose as she contemplated the challenge. Her clawfoot mount gave a little cry of excitement in response. The connection between dinosaur and rider was a close one. Some riders preferred to raise their mounts from the moment they hatched. Others caught wild ones and magically imprinted on them. Huatli was deeply practical. Her mounts were not her children or pets. They were tools to be treated with respect, an extension of her warrior-self. The sky beyond was an angry gray, and choppy waves crashed against an outcropping of rock that jutted out into the sea. Near the stone, Huatli could make out two broken and battered ships. One bore the colors of the Brazen Coalition, and the other had the tattered black sails of the Legion of Dusk clinging to its broken masts. A person caught her eye. She must have been a person, but she was unlike anyone Huatli had ever seen before. Her skin was emerald green, more reptilian than anything else, and her shining golden eyes were wide, searching for fellow survivors. A tangle of vines rose out of her head and licked at the air, and she wore a captain's coat and breeches. Huatli knew better than to approach the ships. Whatever storm the merfolk had conjured had been enough to beach the ships, but probably not enough to eliminate everyone inside of them. While her warrior's training urged her to fight off the invaders, Huatli knew better than to get distracted. Inti approached on Huatli's right. He rode a bladetooth—a sturdy mount significantly larger than Huatli's smaller, more agile clawfoot. Inti looked down at his captain and pointed toward the rock jutting out near the sunken ships. His other hand tapped the net that was strapped to the side of her saddle. Huatli nodded. He must be able to see the River Herald who shaped that storm. She turned to Teyeuh. "Return to the city and summon our forces to deter the survivors." Teyeuh nodded and urged her frillhorn back into the dark green of the jungle. Huatli and Inti turned parallel to the line of the beach and cut through the thick forest just inside where the wilderness met the sand. They made their way through the mangroves and briny water toward the outcrop where Inti had spotted their mark. On the beach behind them, they heard a man's scream. Huatli didn't turn to watch the excitement—she knew she must not lose focus. Instead, she drove her agile clawfoot ahead and burst through the jungle into the bright sunlight. The screaming stopped abruptly behind her, and she saw a body lying on the rock ahead. Huatli urged her mount closer to get a better look. There, lying on the rock overlooking the vast, unending ocean, was an unconscious female merfolk. She looked old; her fins were long and faded on the ends, and jade trinkets hovered in place around the planes of her face. Whoever this was must have summoned the storm that sunk the two ships, and if she was as important as Huatli sensed she was, she would know the location of Orazca. The anxiety doubled in Huatli's chest. This plan had seemed awful at first, but seeing the merfolk in front of her made it that much more impossible. How am I to convince the Sun Empire's oldest enemy to help me? Her courage swelled and her brow lowered in determination. I will find a way! Huatli approached and dismounted. As she walked forward, the merfolk began to shift and move, groggily pulling herself up off the ground. The older merfolk visibly steadied herself, locked eyes with Huatli and Inti at her side, and the fins at her face pulled back sharply in surprise. "I do not intend to attack you," Huatli said firmly. The merfolk closed her eyes. Huatli bristled. What was she doing? The merfolk inhaled, exhaled, then met Huatli's gaze. "He's making his way there. Get out of my way or I will make you do so." What in the world is she talking about? Huatli gripped her blade tightly. The River Heralds were famously obtuse. She knew negotiating with one to secure a guide would be difficult, but her gut told her that negotiating with this one may be like asking one of the Sun Empire shamans for advice on what food to eat that day. No answer would be straightforward. "My name is Huatli, future warrior poet of the Sun Empire. Tell me your name." 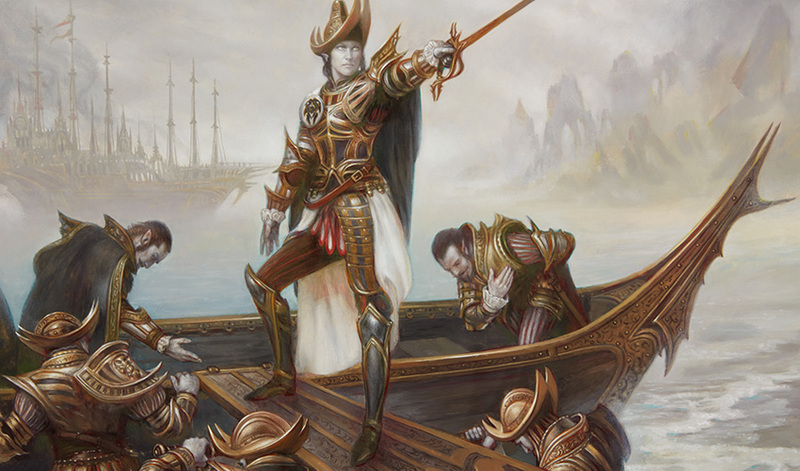 "I am Tishana of the River Heralds," the merfolk responded cautiously, "and Ixalan is in peril." She clawed a hand upward, and a wave crashed at the rock beneath them. An intimidation tactic. Huatli was not so easily frightened. She held her ground. 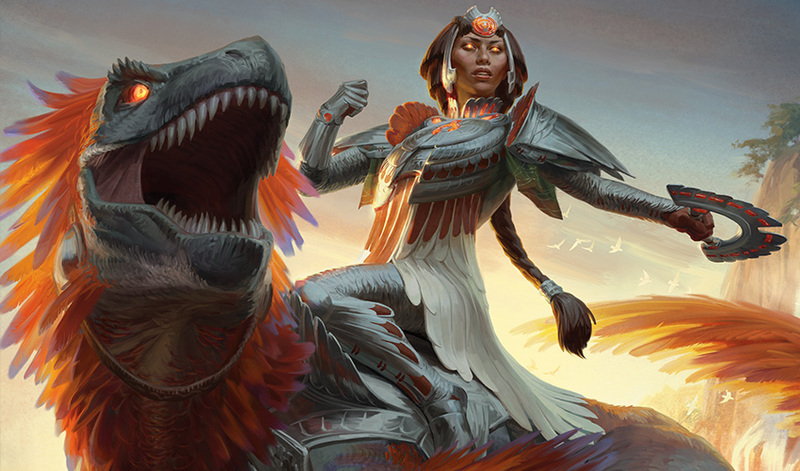 "Why is Ixalan in peril?" Tishana's fins fluttered in agitation against the sides of her face. "A River Herald has betrayed my cause and is traveling there now. Kumena means to unbalance radical dependencies." The merfolk reminded Huatli of what might happen if she crossed one of the Sun Empire shamans with a slightly nutty aunt. A wise and perceptive mystic with the vocabulary of the resident eccentric. "I want to go to Orazca, but I need a guide." The merfolk's fins twitched. "What?" "She has seen it," Inti interjected, looking at Huatli. 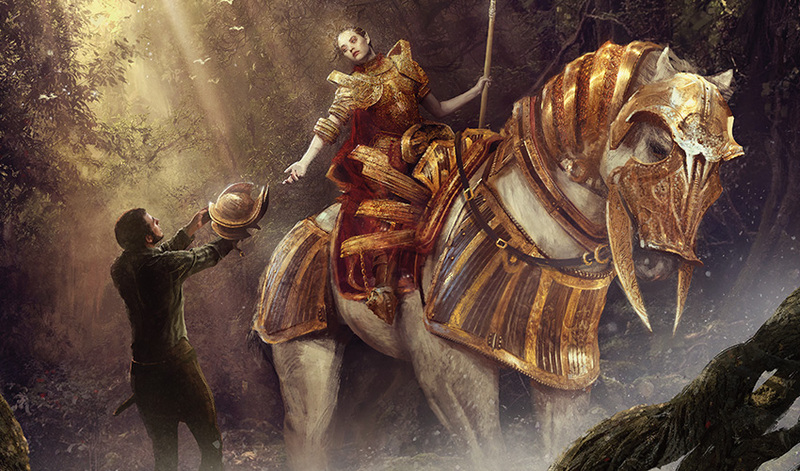 Huatli chose her words carefully, "I wielded a strange magic, and I saw a golden city." Tishana gave a deadpan look. "You saw a golden city." Huatli frowned, embarrassed. This conversation was too familiar. "I saw Orazca," she firmly replied. Inti interjected with a measured voice. "The Golden City needs to be found if we want to protect both of our peoples." He gestured to the chaos of the beach. Tishana turned to Huatli and leaned forward in interrogation. Her face was stern and straightforward, with a predator's focus. "And you simply need to go there? Not possess it? Not claim it for your own or in the name of your Empire?" Huatli's mouth was a hard, stern line. She kneeled, and placed her weapon on the ground, looking up at the merfolk with utter respect in her eyes. "Something within me made me see the city. I am certain it is proof that my mission is crucial to the survival of both Sun Empire and the River Heralds alike. We are not each other's enemy." The merfolk paused and studied Huatli's face. She seemed to look straight through her, and Huatli felt incredibly young looking back at Tishana's gaze as she knelt on the ground in subordination. Tishana lowered her eyelids and moved her lips to one side as she thought out her response. She lowered a hand and placed it in front of Huatli's forehead. Huatli felt oddly warm, as if someone had prodded at a fire within her chest. Tishana opened her eyes. "I sensed you, days ago," she said. Huatli couldn't help her look of surprised repulsion. The merfolk stepped away, ignoring her response. "I sensed a tremendous tug at the energy of our world, like a dolphin trying to leap out of a river." Tishana was more than a little unnerving. Huatli was no stranger to metaphor, but the merfolk operated on an entirely different level. "Do you know what it was?" Huatli whispered urgently. The merfolk's pupils thinned. "I know only that the surface of our world is impassible from underneath. Some can fall in, but once submerged, cannot leap out." Huatli had no idea what Tishana meant by that. "I felt a similar tug this morning," she said, "in the direction of the sea. And again, two months before, much further past the horizon. But that energy did not belong to you." The merfolk knelt and looked Huatli in the eye. "If you say you saw a city when you skimmed the edges of our world, then I believe you." Inti looked down at Huatli and smiled in pride. Huatli was thankful he was here as support. "But I want your word, Huatli." Tishana glared. "We are going to the city to keep Kumena out because his presence threatens you as much as it does us. If you try and claim Orazca for your own, I will not hesitate to kill you." Huatli felt deeply uncertain about how the exploration would play out. This was going to be a very interesting trip, but she had no other options. Huatli climbed up on her mount and offered a hand to the merfolk to join her. Tishana looked at the hand as if it were made of insects. "I will travel independently," she scowled. The merfolk lifted a small jade item from a bag at her side and set it on the ground. She lifted a hand, and the jade lit from within, a firefly glow encased in mottled green. The rock and vines that lined the outcropping of rock they stood on began to vibrate, moving toward the jade totem as iron to a magnet. 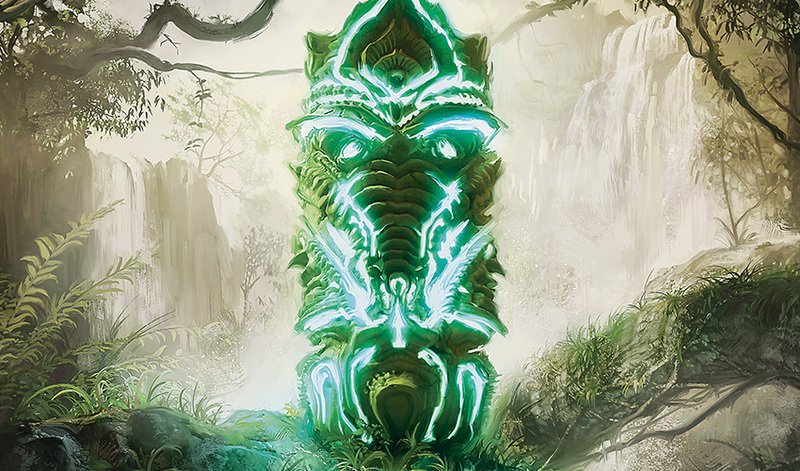 The rock and wood curved and expanded, picking up the totem as it did so, and began to form the shape of an elemental. Within moments, where once was a beautiful carving was now a fierce elemental that stood as tall as Huatli's clawfoot. Tishana held out a foot as part of the wood formed a foothold. She stepped up, and grabbed the top of her new elemental mount. Huatli swallowed. This was a woman of immense power. She turned her own dinosaur and looked down over the sand to see a scene of absolute chaos. Some survivors were paddling out of the wreckage of the two ships, and a large patch of blood stained the white of the beach. A vampire was running into the thick of the jungle. Huatli pointed toward the fleeing conquistador. "Inti, tail them! Track me into the rainforest when you finish chasing them off." Inti tore off down the side of the rocks and into the jungle. Huatli whistled a quick melody, hoping Teyeuh was not yet out of earshot. She silently thanked Teyeuh for remembering her training; Teyeuh heard the command and immediately turned to follow Inti and the vampire into the jungle. Making a run for Orazca, no doubt, Huatli laughed to herself. Pathetic leech. The beginning of a poem blossomed in her mind as she trotted her clawfoot down the other side of the outcropping. She looked over the wrecked ships and mused on how her poem about this expedition would begin. A ship crewed by leeches chased a ship crewed by fleas . . .
"Stop. Turn toward the river," Tishana yelled in command. The merfolk turned the elemental she was riding and bounded toward the river. Huatli followed suit, and stopped alongside Tishana. Tishana sighed with the impatience of a busy scholar. "Someone is casting an illusion there, on the water." Huatli looked past the merfolk's hand into the distance where the ocean water mingled with the river and found herself transfixed. The river was slow-moving and gentle. No waves disturbed its current, but there, a gentle wake was cutting through the water. There was no traceable source, and there was clearly nothing swimming underneath. "It is . . . odd. Are you certain it is an illusion?" Huatli asked. Tishana scoffed. "I've been casting illusions longer than you've been alive." "But do you think one of the Legion of Dusk survivors did that?" The merfolk shook her head. "Such illusions are beyond their mastery. I worry that this is a greater threat." 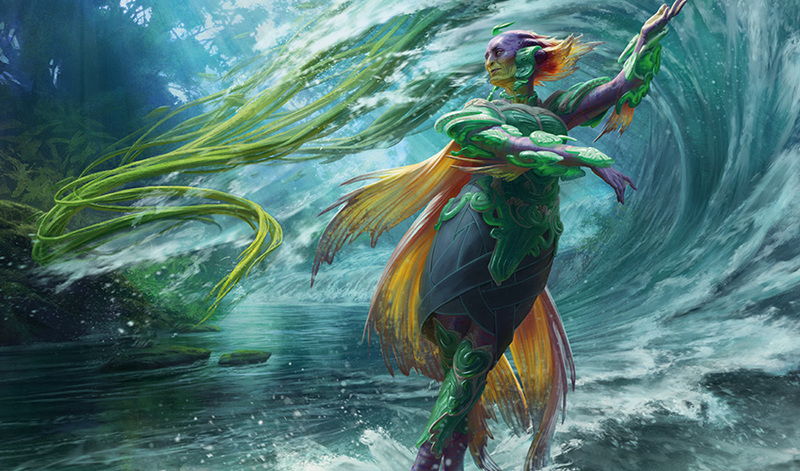 With no warning, the merfolk turned her elemental and bounded into the rainforest. Huatli grunted with frustration and urged her mount to travel faster to follow. They ran into the thick of the jungle, keeping the strange wake of the river in sight. Leaves and vines whipped past Huatli's face, and her heart sang with hope. Perhaps this was what she was supposed to do after all. Everything about this situation was new and uncomfortable, and Huatli was loath to admit that she was anxious, but things seemed to be working out well so far. To her knowledge, no River Herald had ever willingly worked with a Sun Empire warrior. Tishana's assistance still felt extraordinarily strange. Huatli couldn't help but wonder if the merfolk planned to take advantage of her. It didn't help that she couldn't get a read on Tishana. Huatli's clawfoot chirped in excitement. Its feet pounded a steady rhythm against the vegetation of the jungle floor. "Has the Sun Empire heard the whispers?" Tishana yelled above the slap of leaves and rush of humid jungle air. "Do you mean actual whispers, or rumors?" The merfolk ignored her request for clarification. "One of our own overheard a conversation on the outpost of High and Dry. We later corroborated it with word from one of yours. There is a captain of the Brazen Coalition who possesses a compass that can locate the Golden City," Tishana said. "She has emerald skin, and—"
"—and hair that looks like vines?" Huatli finished. The merfolk was silent. Only the pounding of her elemental's rock-and-wood feet against the jungle floor broke the quiet. "I saw her in the wreckage," Huatli said. "If she possesses what you say she does, then that wake is certainly her." "She must be a skilled illusionist." Tishana's eyes were trained on the wake in the river. Huatli tightened the grip on her dinosaur's reins. "Then we must be ready. When the river narrows and they can go no further, we strike." "We need their compass more than we need them dead," Tishana said. "I do not intend to kill them," Huatli said with offended irritation. Tishana tsked. "The essential mists of morning," she said with a sage nod. Huatli bit the inside of her lip in frustration. "Please clarify what mists—"
"The location of Orazca is a secret even to us." "You don't know where it is . . . at all?" The merfolk glared back. "We know its general location." Huatli clamped her mouth shut. She took a deep breath and did her best to hide her mounting frustration. "It is beyond the Sun Empire territory, though, yes?" "It is over the mountain range that separates Pachatupa and Quetzatl, and across the lake after that." Huatli referenced her mental topography. "North or south of Lost Vale?" "And that is all you know?" Huatli nodded. She felt in over her head. We're going to need that compass.